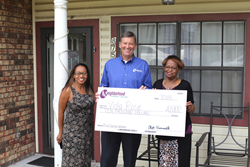 Viola Rose's hard work and diligent savings pays off when she receives a $10,000 surprise from her local credit union. I find it much more satisfying to know I am in control of my finances. Seeking financial education, exercising spending discipline and saving for the future are good habits that are good for the bottom line. But they can also reap unexpected rewards – such as an extra $10,000 in your savings account, Neighborhood Credit Union member Viola Rose learned this week. The Lancaster woman, who works as a nurse assistant at the Veterans Administration Medical Center and has been a credit union member since her daughter recruited her in 2011, received a surprise visit Tuesday morning from Neighborhood Credit Union President Chet Kimmell, who presented her with an oversized check for $10,000. The actual money was deposited directly into her credit union account. Rose said she now puts a portion of each paycheck directly into her savings account and plans around a monthly budget. But the biggest change in her financial habits was learning how to resist impulse purchases. Rose’s name was drawn from the ranks of members who participate in the Prize Savings Account, a special account the not-for-profit credit union created to encourage people to save money. Neighborhood Credit Union rewards good saving habits with prize drawings throughout the year, including a $10,000 prize each quarter and culminating with the $25,000 grand prize at the beginning of each new year. Since its inception, the number of credit union members with Prize Savings Accounts has nearly tripled. How the Prize Savings Account works: Neighborhood Credit Union members receive one drawing entry for every $25 monthly average balance in their Prize Savings Accounts. The greater the savings, the greater the chance a member has of winning. Members are eligible for monthly $1,000 drawings and quarterly $10,000 drawings. At the start of each year, a winner is drawn for the $25,000 grand prize based on the average monthly balance in the savings account at close of business December 31. About Neighborhood Credit Union: The oldest credit union in Dallas (chartered April 18, 1930), Neighborhood Credit Union is a not-for-profit financial organization serving Dallas and Ellis counties, as well as the city of Arlington. With branches in Oak Cliff, North Dallas, Richardson, Arlington, Mesquite, Duncanville, Waxahachie, Lancaster, Grand Prairie and Coppell and assets topping $360 million, Neighborhood Credit Union has a membership of 32,000 and continues to welcome new members daily. For more information, call (214) 748-9393 or visit http://www.myncu.com.